It shouldn't be a big surprise to you that most of the items on our wedding registry were kitchen-related. Just for shits and giggles, I put a few big ticket items on there (I was secretly hoping that people might chip in to purchase one big present). My cousin, Liz, actually sprung for one of the fancy gifts and she even personalized it with a slammin' recipe for My People's Chicken. Since she reads my blog, I thought it'd be nice to share this evening in food with her as a small token of appreciation. I guess you can peek at this, too. This recipe was really easy to put together (thanks, cuz)! The hard part was waiting five hours for it to cook. 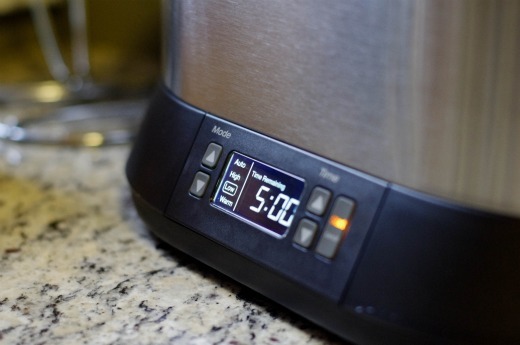 If you want to expedite the process, you can set your crock pot to high thereby cutting the cooking time in half. I would've done that, but thought it'd be fun to fill my apartment with the aromas created by this dish and it was, until I forgot I couldn't even sneak a taste of it until the timer said it was done. Stupid, salmonella. Anyway, let's go! Dress your poultry with salt and pepper. The recipe calls for a whole chicken, but I opted to substitute a whole chicken-amount of legs and thighs. Why? I just like them. I also chose to brown my birdie bits in coconut oil for pretty much the same reason. Place the chicken in your brand spankin' new (or new-ish) crock pot when it's a pretty shade of gold. After the chicken is browned, it's time to make the sauce. This part is pretty quick and painless. 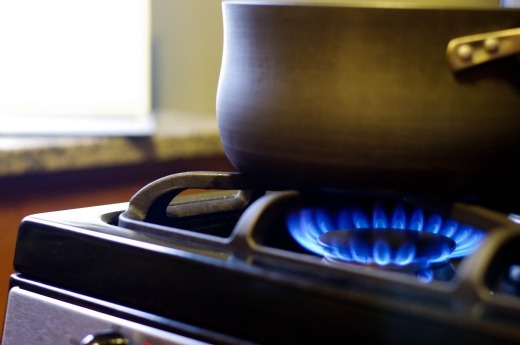 Once you've brought everything to a boil, pour it over the stuff in the the pot. Throw the rest of the ingredients on top of the chicken, put the lid on the crock pot, set the timer and wait. That's pretty much all there is to it. I served this dish with cauliflower "rice" (similar recipe here) because it seemed wrong to eat Cuban chicken with anything else. 1. Brown the chicken. Season the chicken pieces with salt and pepper. In a large frying pan over medium-high heat, warm the oil. Add the chicken pieces in batches if necessary, skin side down and cook until golden brown on the bottom about 7 minutes. Turn the chicken and cook second side until lightly browned about 3 minutes. 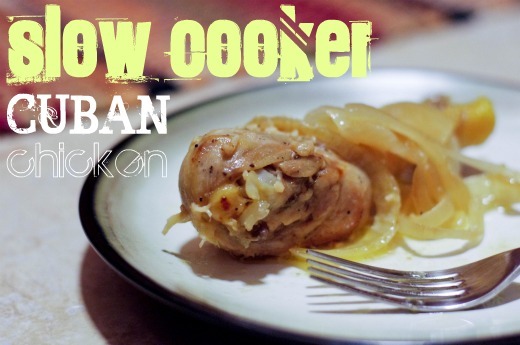 Transfer all browned chicken to slow cooker. 2. Deglaze the pan. Pour off all but about 1 tablespoon of fat from the frying pan and return the pan to medium-high heat. Add the onions and saute until just barely golden brown. Add garlic to the onions and saute for a couple more minutes until the onions are golden and the garlic is fragrant. 3. 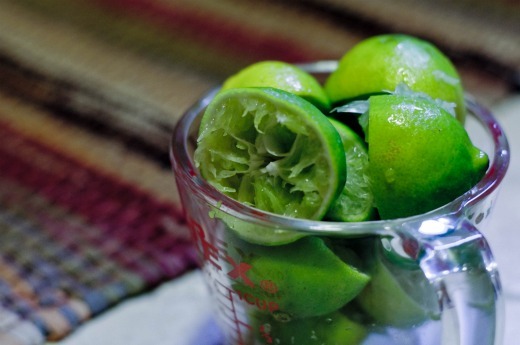 Pour in orange and lime juices. Raise the heat to high, bring to a boil and deglaze the pan, stirring to scrape up the browned bits on the pan bottom. Pour the contents of the pan over the chicken. 4. Cook the chicken. Add the bay leaf and sprinkle with 1 teaspoon salt. Cover and cook on high heat setting for 2 1/2 hours or low heat setting for 5 hours. Remove and discard the bay leaf. 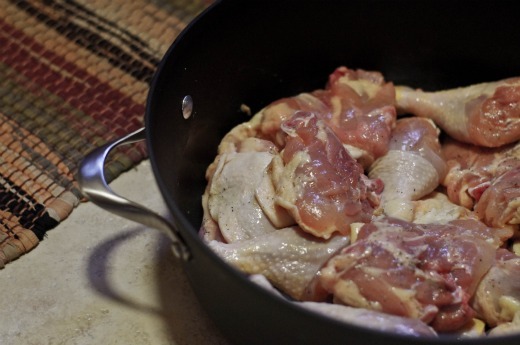 Transfer the chicken to a serving dish. Season the sauce to taste with salt and generous amount of pepper. 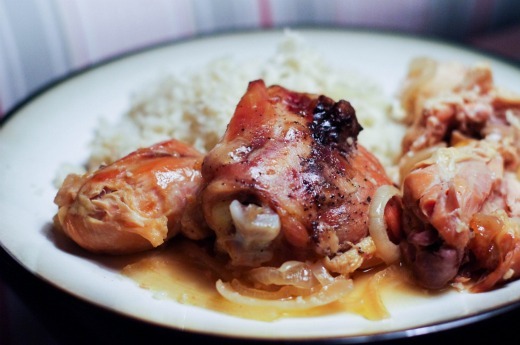 Spoon the onions and sauce over the chicken. Serves 6-8. Especially the blue flame one. glad to hear your enjoying your new kitchen toy! ps....try the recipe with pork......it is even better. This right here inspired me to go out and buy myself a slow cooker. I'm so ready to use it. Perfect for a full time working housewife! Congrats on your wedding!